Lexmark 10N0016 (#16) Black, high yield, Premium Quality Remanufactured Inkjet Cartridge designed to work in the i3 Color Inkjet Printer, X1110/ X1150 PrintTrio/ X1155/ X1160/ X1170/ X1185/ X1190/ X1195/ X1270/ X2230/ X2250/ X75 PrinTrio, Z13/ Z23/ Z25/ Z33/ Z35/ Z515/ Z517. The use of compatible supplies does not void your printer warranty. 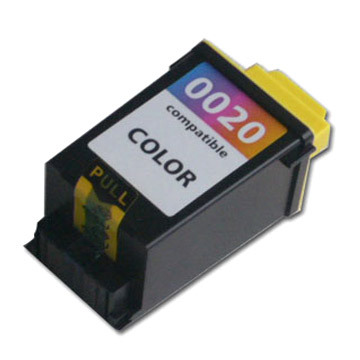 Lexmark 10N0026 (#26) Tri-Color Premium Quality Remanufactured Color Inkjet Cartridge designed to work in the i3 Color Inkjet Printer, X1150/ X75 PrintTrio, X1185/ X1270/ X2230/ X2250, Z13/ Z23/ Z25/ Z33/ Z35/ Z515/ Z517/ Z605/ Z611/ Z615/ Z617/ Z645 copiers. The use of compatible supplies does not void your printer warranty. Lexmark 15M0120 (#20) Tri-Color Premium Quality Remanufactured Inkjet Cartridge designed to work in the Z42/ Z43/ Z45/ Z51/ Z52/ Z53/ Z54/ Z705/ Z715/ Z82, X84/ X85/ X4250/ X4270, X125/ X63/ X73/ X83 All-In-One, P122 PhotoJet Printer/ P3120/ P3150/ P707 copiers. The use of Remanufactured supplies does not void your printer warranty. Lexmark 17G0050 (#50) Black, High Yield, Premium Quality Remanufactured Inkjet Cartridge designed to work in the P3120/ P3150/ P707/ Z12/ Z22/ Z32/ Z705/ Z715 copiers. The use of Remanufactured supplies does not void your printer warranty. Lexmark 17G0060 (#60) Tri-Color, High Yield, Premium Quality Remanufactured Inkjet Cartridge designed to work in the Z12/ Z22/ Z32 copiers. The use of Remanufactured supplies does not void your printer warranty.